I had an awesome day on the water last week which was dominated mostly by gorgeous brown trout so I though I would post a few photos of some of the browns I have caught recently and try to shed a little bit of light on the subtle differences we see in these fish. Brown trout (Salmo trutta) were first introduced in New Zealand waters in the 1860's from British stock that came via those already acclimatised in Tasmania. They are currently the most widespread introduced species of fish in our waters. Brown from the Mangatutu Stream. Golden brown with red spots. 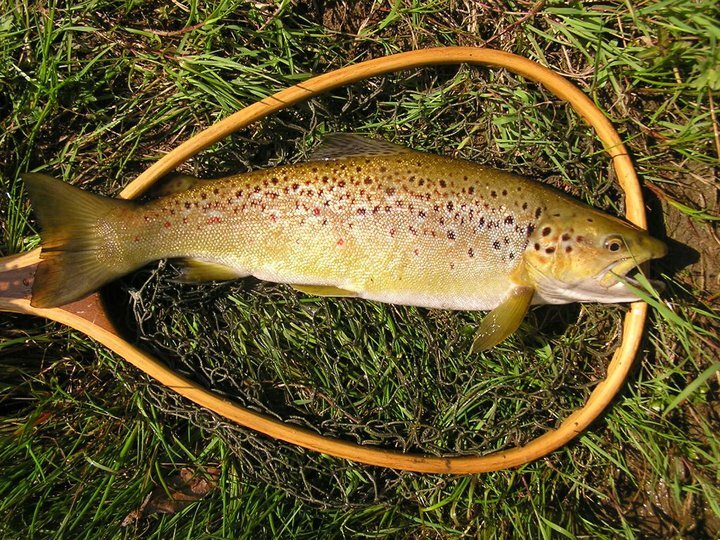 Brown trout are an extremely pleasant fish to look at. Some fish are golden brown with black and orange spots and some are shiny silver bullets. The colouration of these fish has to do not only with their environment but also their lineage. Traditional wisdom and research says that lake fish tend to be the silver in colour and more closely resemble their cousins the Salmon. However think the only bearing that habitat has on a brown trout's appearance is the amount of spots and the pattern of those spots. What is more important is the where these fish originally came from and where what their migratory and spawning behaviour is. 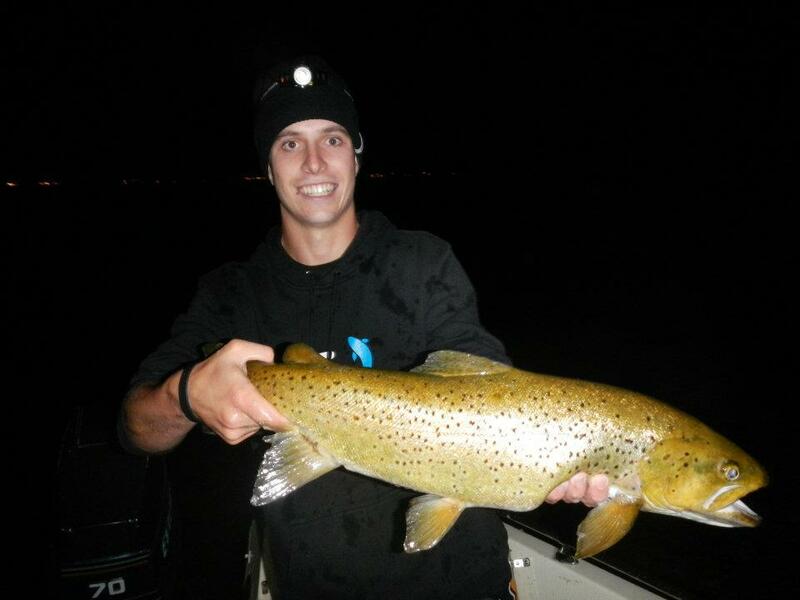 Big brown from Lake Rotorua. Note that they are all black spots. Many of our bigger lake fish such as the Rotorua trout were stocked from bloodlines that came from the Scottish Lochs an so they naturally adapted well there. Our small stream browns which do not grow to the same sizes are usually descended from fish found in the small streams of Germany. These fish can be identified by their small red spots that tend to be placed closer to their belly. However, both strains of fish were stocked, so one may find a smaller 'German' brown in a stillwater, while there are many bigger 'Scottish' browns in our rivers. Also, the migratory patterns of these fish have an effect on appearance however this normally determines the number of spots on a fish. This can be useful for finding out if fish are remiaining in particular fishery or choosing to migrate up or downstream. More spots usually means an upstream fish which is in clear water and less spots means downstream and murky although this is not always the case. Brown from the Whakapapa River. No red spots on this guy. 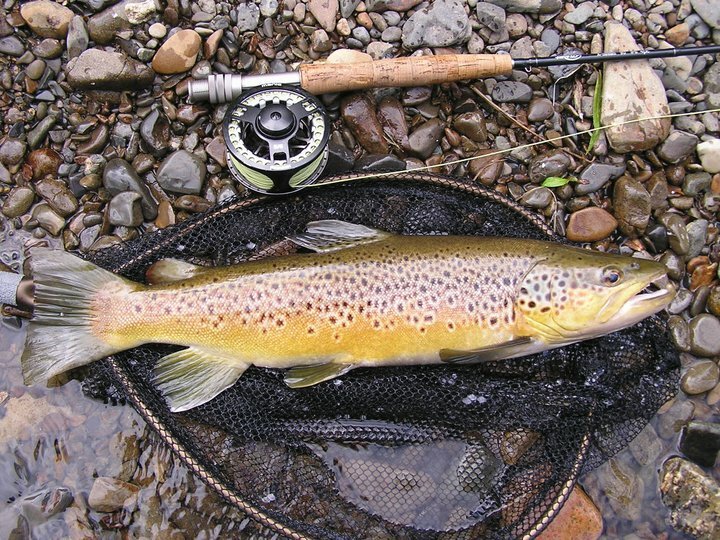 One exception to this is the sea run brown trout which will take on a silvery appearance. This is also true of the browns that come out of Lake Taupo. 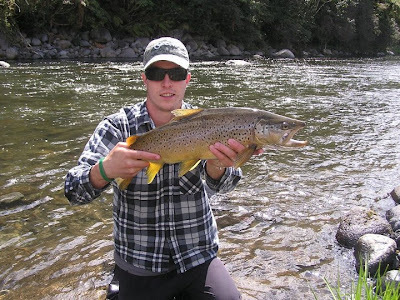 For example, I have seen a 5lb brown caught on the Tongariro that resembled a sea run trout, so it would appear that these fish think that they are going to sea when they are in fact migrating from a big lake. This said, lake Rotorua is obviously not big enough to trick the fish into thinking this as I have never come across one of those silvery browns there. Another Mangatutu fish. All black spots here though. Two different strains in the river? From the fish that I have caught, the fighting ability and characteristics differ greatly from fish to fish. The general rule that I have developed is that any brown trout under 4lb that is in good condition will fight like an absolute demon. They will jump as much as any rainbow as well as bury their head in a clump of weed. However once they get a bit bigger, they tend to fight like a rock. They will usually have one or two good runs and then pick a spot in the river and stay there. Little brown from a small stillwater. Fought extremely hard and jumped about 5 times! Note the red spots. 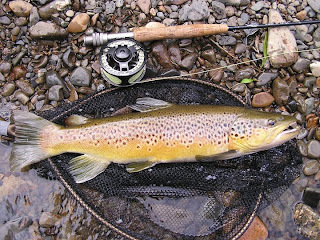 Brown trout are undoubtedly one of my favourite fish to catch. In the North Island we tend to be rainbow dominated so it is quite often a nice surprise to catch one of these amazing fish. Even with all my theories on browns listed above, there will always be something different. One persons experience with brown trout may be different to the next but I think we can all agree that they are fish that we love to catch and that they have a touch of mysticism about them.